Peace prospects between the two Koreas look even brighter now as they agreed on Monday to march together under a unified peninsula flag in the next Asian games. This development follows the successful Trump-Kim summit held in Singapore last week. 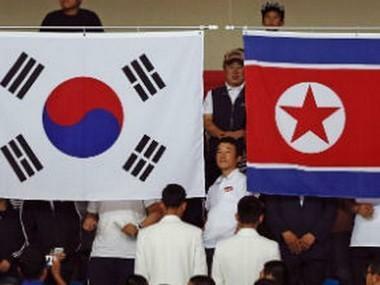 South Korea and North Korea also agreed to form combined teams to compete in the Asian games. A joint statement from the two Koreas confirms this new positive development in the relations of the once long, bitter rivals. Indonesia is set to hold the next Asian games scheduled from mid-August to early September this year. The two Koreas agreed to create combined teams for the upcoming games and for other international competitions, such as a shooting competition set to start in August in the South. They will hold more discussions to finalize the details. The agreement for participation in the Asian games is part of the range of efforts to promote reconciliation, including opening military hotlines and arranging reunions for families of Koreans long separated and divided by the 1950-53 Korean War. The two Koreas will also hold a series of basketball games in the North Korean capital of Pyongyang on July 3-6, marking the anniversary of a July 4, 1972, inter-Korean agreement on unification. The South will send a delegation of 100 people, including about 50 players and referees, for the basketball friendly match in Pyongyang next month. South Korea will host another series of matches to be held late this year. The two countries also said that the agreement they made today related to the Asian games is a follow up also to the success of the recent Winter Olympics where the former bitter rivals first came together.